After consulting all three of his goalkeepers, Hearts coach Robbie Neilson will again let Neil Alexander, Scott Gallacher and Jack Hamilton fight for the position next season. Neilson stated today that he expects Alexander, 37, to continue as first choice but explained that Gallacher and Hamilton will get chances to stake a claim. Neilson spoke to all three keepers about the situation at the end of the season and received assurance that they are happy to continue next year. Both Gallacher and Hamilton have aspirations of becoming No.1 but had to operate as Alexander’s deputies during Hearts’ Championship title win. The trio are all under contract for next season, with Hamilton’s deal running until 2017. Neilson expects him and Gallacher to push Alexander hard during pre-season training. “We’ve had a chat and all three of them will be back for pre-season. It’s a clean slate for everybody so they will play in pre-season games and then see where we are,” the head coach told the Evening News. 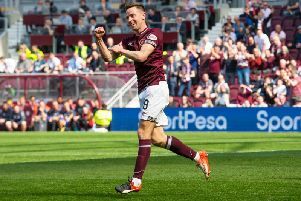 This year’s Hearts recruitment drive will be on a far reduced scale than last summer, when a new team of players arrived. Neilson is looking for four or five new faces this time as he prepares for his first campaign managing in the Scottish Premiership. There must still be a period of preparing properly, however. Neilson still attends Riccarton every day even though Hearts’ season ended with last weekend’s trophy party. The work to get ready for the top flight is well underway and he is determined to get a head start. As ever, the mantra is “improvement”. “I’m in at the academy most days, although I’m starting a little bit later,” he explained. “I’m in from about ten o’clock in the morning until about three in the afternoon. A lot of times I’m involved in meetings. We had a meeting with the coaching staff on Tuesday about how things have gone for us. We talked about what we want to do differently, the things we felt went well last season and what we can improve on. “We have meetings with different departments within the club like physiotherapy, sports science, coaching, everyone. We always look to see what areas we can improve and what we need to do to be better. This gives us a chance to build for next season. Then we go away on holiday and then start putting the programme together for the pre-season. A short trip to the Republic of Ireland is likely to take place at the start of July. “It’s on but we still need to nail down the teams we’re playing. We’ll go across for a few days,” said Neilson.